Roma are reportedly prepared to sell a key figure in their current squad in order to raise the funds required to land Ajax starlet Matthijs de Ligt. Since arriving in the Italian capital in 2014, Kostas Manolas has established himself as a fundamental figure in the heart of the Giallorossi backline. The Greek international has gone on to make 182 appearances for the club, although they haven’t been able to end their wait for silverware in that time which will undoubtedly be a disappointment for them regardless of their ongoing ability to finish in the top four. Perhaps in order to take that next step, Roma need to make difficult decisions and according to Sportmediaset, it’s suggested that Manolas could be sacrificed and sold for €36m as per the clause in his contract in order to fund the move for De Ligt. The 19-year-old has made quite the impression for Ajax to date, making 74 appearances for the senior side despite still being so young while he’s also gained 11 caps for the Netherlands to prove that he’s ready to become a crucial figure for club and country. As noted by Goal.com, the likes of Barcelona, Man Utd and Tottenham have all been linked with the Dutch international, but it would appear as though Roma can now be added to that list of interested parties. 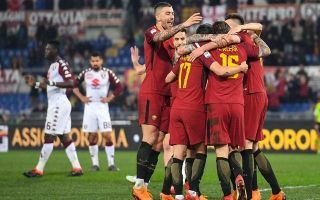 The signing would fit the mould of what sporting director Monchi is trying to build at the Stadio Olimpico, with an emphasis on bringing in young stars with a high sell-on value which is seen in the likes of Justin Kluivert, Cengiz Under and Patrick Schick. De Ligt could follow that same path, but it remains to be seen if Roma can seemingly raise the funds needed and if they can convince the talented youngster to choose them over the competition.